The kit was easy. Just screwed together and the switch was perfect. 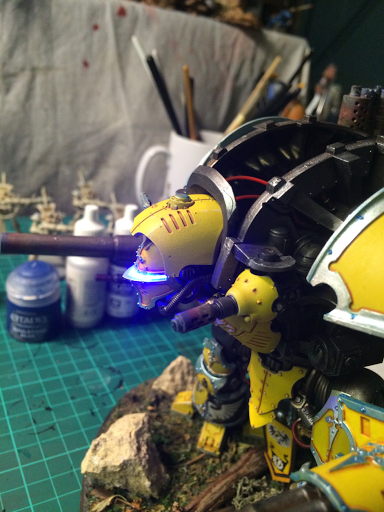 A knight has a handy compartment in whoch you can store LED's like this. If you do not glue the carapace down you can remove it easily for access. I assembled the body and the head seperate and drilled a hole out from the body behind where the head would rest. This is where the wire would come through. Next I drilled two holes back from the front of the head straight through where the eyes would go. Then hollowed out further using a file. 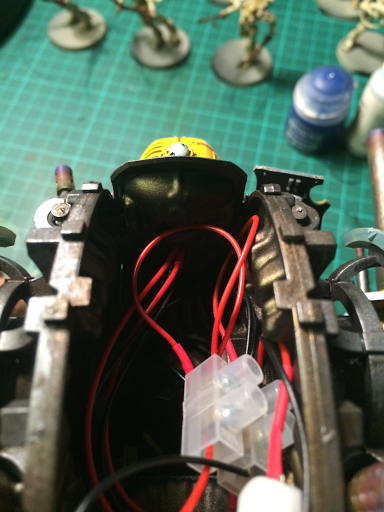 Tight, thread the wire through the body and attach to the conector. Cover the face and direct the light. Made forgeworld knight heads which already have the masks attached.